A couple of weeks ago, my wife found a recipe online for fish tacos with a mango salsa and asked if I'd make them. 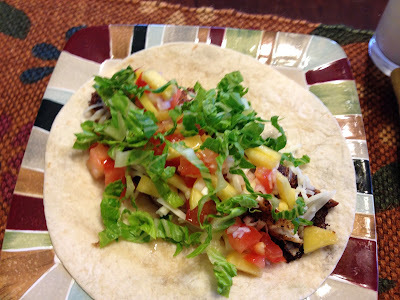 I made mental note of it and pushed it aside, knowing I didn't really need a recipe to turn-out a good fish taco. Plus, I think it had a couple of odd ingredients I don't normally keep in the house. Fast-forward to this week when I happened to pick-up a big bag of frozen Tilapia. My wife went down to the chest freezer for some bread and came back up saying, "Hey, I noticed a lot of fish in there. Can you make fish tacos for dinner?" I thought about it, realized I had most of the ingredients, and agreed. Thus was born this recipe, which we've had two times this week because it's light, refreshing, and rediculously easy to make. Note: I used tilapia because it's cheap and was available to me. Any mild white fish will work well and probably a few darker ones too. Use what you like, but you'll have to adjust the cooking time and method to suit the thickness of your fish. Tilapia is very thin. 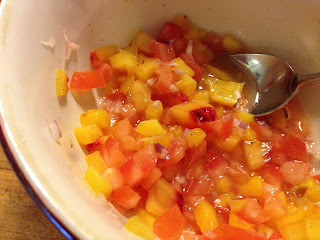 1) Dice the tomato and peach and place in a bowl with the minced shallot. Add the juice of the lime, and a teaspoon of chopped cilantro or parsley if using. Stir to combine and taste. Add salt, pepper, and sugar a little at a time and taste until you like the flavor. This is personal preference. Set the salsa aside to marinate. 2) Dry the fish with paper towels. Sprinkle one side generously with Cajun seasoning and salt (if your seasoning is salt-free). 3) Heat oil in a heavy-bottom saute pan on medium-high. Place the fish seasoning-side down in the hot oil and allow to cook until dark brown on the bottom and the edges start to crisp. Don't move the fish around. 4) Once the bottom is crisp, gently flip the fish with a spatula and use your fingers or a fork to guide it so that it doesn't splash the oil. Continue to cook the other side. If the other side begins to darken before the interior is done, reduce the heat to low and cover the pan to trap steam. Slide a knife or fork into the center of the fish to check for doneness. 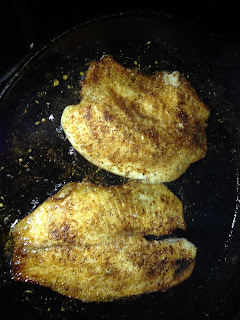 5) Remove the cooked fish to a cutting board and cut into slices or chunks. It will probably break apart. Divide among the taco shells. Top each with salsa (draining-off as much of the liquid as you can), cheese, and lettuce. Serve.